Well another week all gone, they seem to be flying by at the moment with autumn fast disappearing into winter, already we have had more frosts here in Hampshire than we did for the whole winter a couple of years ago. Despite that there’s still loads of work to do in the garden and loads of things to admire and enjoy the beauty of. Yes at times we may need to look harder but it’s all still there. The tree lupin, Lupinus arboreus, is a great shrub to have in the garden, not that common to have its lovely flowers showing off at this time of year but also look at how the water holds on the leaves, so beautiful! Sometimes we have to look closely to see beauty in the garden and most people would walk past this pittosporum tenifolium and not notice the seed pods opening up but look at the colour of those seeds! Tree lupine? That seems like an odd thing to plant with all your more interesting specie. Ahh it’s quite a exotic plant here in the uk! I need to grub them out and pile them up to burn. Ick! I suppose they have pretty flowers. The soft yellow is nice. Some look white. I do not really think of them as ornamentals. They are pretty interesting for how the fit into the ecosystem. New ones come up wherever a burn pile was. The fire really stimulates germination. Nice Six sir. Good luck with the new garden, that’ll be quite a transformation. You’ve really got it made. You can extend your garden beyond its boundaries, remodel it, grow lots of different plants, find lots of different sixes. And the best part is someone else buys all your plants. It’s great fun John, would never change my career for anything well apart from being paid a shed load more money! Such lovely things. What a great job you have! I decided to leave off pruning my pittosporum for this year. When is the best time to prune it? A really diverse collection from you this week. You’ve captured the whole of the season in these few shots. Love the contrast of the rose w/the background – is that sedum? I can’t tell. And the sneak peek into the nest . . . but have to admit the cherry is my fav. I really, really love the trunks & branches of trees & shrubs, so you know the Tibetan cherry wins my heart. I hope you have many fine days, reclaiming this garden for your clients. I’m very fond of lupins, but Lupinus arboreus is new to me. It’s attractive with raindrops gleaming on its leaves. And the nest! That must be the upside of climbing up into trees. 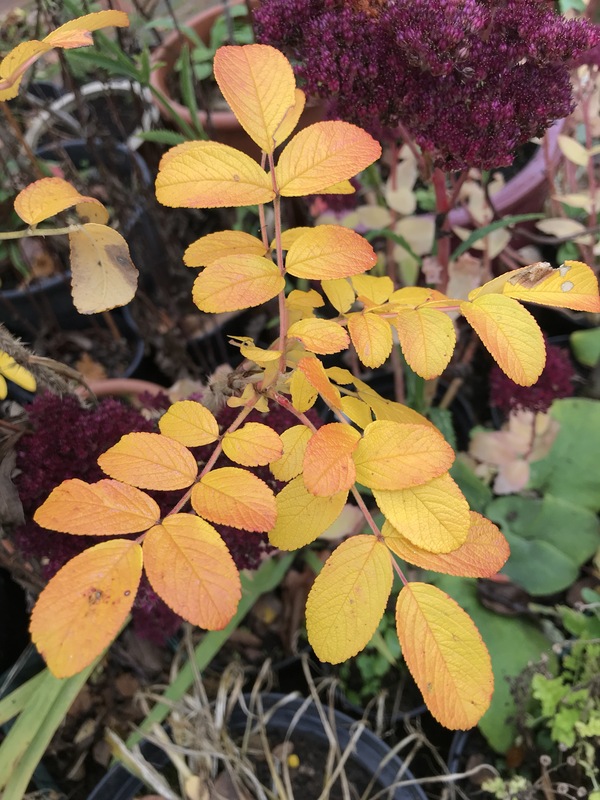 How lovely to see the foliage of the rosa rugosa – I have just planted two of them and am really hoping they will give me some yellow in the autumn. Great pictures and a lovely sentiment, to look for beauty in everything. Those seeds look like prunes to me. I can’t wait for my Cercis to change colour – I’ve yet to get the candyfloss smell though. Apparently, I need to get my hands on some Pittosporum! It’s well worth the wait fella, don’t tend to get the candy floss smell with the cercis sadly it’s the ceridelpyllum (speling!) that produces the candy smell 👍 pittosporum is a brilliant shrub!